The value of any photo accessory depends largely on the number of ways it can be used. Versatility is the key to something that becomes an essential must-have tool. 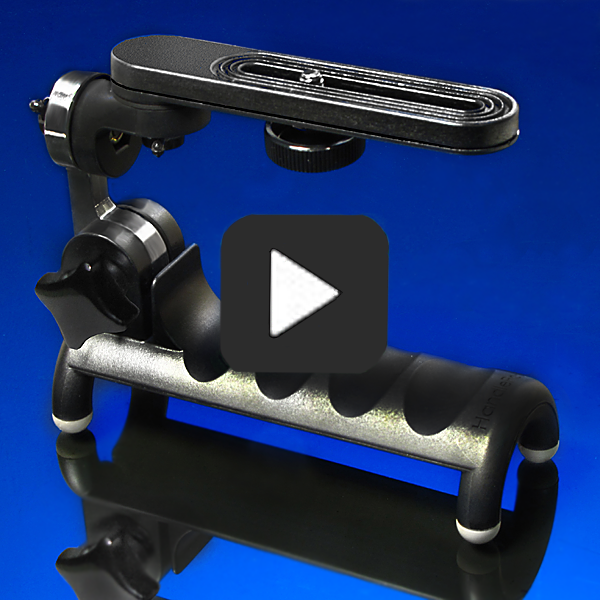 HandlePod was designed to fill a wide range of functions for both still photography and video. The following is a discussion of some of the many ways that HandlePod can be used. HandlePod provides a sturdy grip for greater stability when hand holding any camera from a DSLR to a smartphone with a tripod adapter. But it is a handle with a difference. You can hold it with your hand or you can press it by hand against any solid support for dependable camera stabilization. Anything can be a camera support with just HandlePod and your hand. Handlepod opens up a whole world of long exposure night photography without the weight and bulk of a tripod. HandlePod attached to a power pole. Want to attach your camera to an object? The elastic cord will secure the HandlePod to many supports, even large ones. The cord stretches to over four feet. Tie the HandlePod to power poles, lamp posts, trees—anything the cord can wrap around. It’s secure and strong. The cord won’t slip or come loose. Need a camera support that sits on a level surface just like a mini-tripod? We’ve got that covered too—for both portrait and landscape composition. Just rotate the camera mount to balance it over the handle and it is self supporting on any level surface. No need to carry a mini-tripod when you have HandlePod. With a few simple alterations and DIY additions there is even more that HandlePod will do. Just add a length of nylon cord with a knot in the end and you have an instant stringpod. Slip the knotted end into the slot in the HandlePod, stand on the free end and pull up to create tension. The string tension plus the improved grip of the HandlePod offers greatly improved stability for hand held photography in low light. HandlePod used on a DIY slider mounted on a tripod. You can spend hundreds of dollars on a slider to provide smooth tracking video shots. Or you can use HandlePod to slide your camera over a smooth surface. A tabletop, a bar, a shelf, HandlePod will glide easily across any smooth object. All that’s necessary is to cover the high friction rubber feet to make HandlePod slide like a sled. Four strips of adhesive Velcro fabric will to the job. No Velcro available? A handkerchief or paper napkin under the HandlePod will do as a temporary cover on the rubber feet. No smooth surface available? You can make your own slider with just a strip of wood and a yardstick. Add ¼-20 T-nuts to the slider and you can mount it on a tripod and use it anywhere. And you can do all this with about three dollars worth of material! HandlePod DIY steadicam with gimbal and roller bearing. Turn HandlePod into a Steadicam with a few dollars worth of PVC pipe and some nuts. This simple hand-held device can be built in five minutes. Yet it works extremely well even though supported by hand. Want more reliable stabilization? For a few dollars and a bit more work you can add a gimbal to further dampen hand motion. To completely isolate hand motion from the camera you can add a roller bearing to the steadicam for very little cost and not much extra work. The finished steadicam with gimbal and roller bearing provides impressive stabilization for that Hollywood style floating camera effect. HandlePod can do all this and more. Use duct tape to attach HandlePod to almost any clean surface to support small cameras and smartphones. Secure it to the external mirror on your car to create an instant car cam for motion video. Versatility is the hallmark of HandlePod. Discover what it can do for you. This entry was posted in Camera Stabalization, Hand Held Stability, Low Light Photography, Shake Free Video, Tripod Alternative on February 4, 2015 by main user.